During the past week a historical event played itself out at your plants and mines. Thousands of white workers went on strike and marched because of exclusion based on race. International broadcasters and news agencies such as the BBC (British Broadcasting Corporation), AFP (Agence France Presse), Russia Today, Fox News, Reuters, Bloomberg and many others carried this voice to the four corners of the world. This is a voice that has not been heard for a long time. The world has seen the frustration of your workers; no one can ignore it anymore. It is a reality. The question is whether you have noticed it. No democracy or employer dare allow a part of its society or its workforce to become alienated to such an extent. The true test of democracy is whether it protects its minorities too. What we have witnessed at your plants is democracy in action and democracy in the making. It was a historical moment but also a historical occasion. If this is ignored then we have denied democracy an opportunity for development. The voice coming from the white workers is a voice calling for balance. It is not a vote against restoring imbalance, but one in favour of restoring balance. If simplistic exclusion in the future is Sasol’s answer to the exclusion of the past then it puts South Africa on a shaky moral basis as far as the future is concerned. To follow a simplistic race approach that excludes white workers in a scheme aimed at addressing the imbalances of the past is an lazy approach. Even an interim intervention has to be morally justifiable. Temporary scaffolding that has to act as support for the road to equality but that is in itself morally shaky, can so easily become the norm, which then becomes normal later on. However, it would not be sustainable. Then South Africa’s future could become a form of normal that is immoral. To calculate the worth of white workers in blue overalls according to their race and to present that as a normal intervention to restore imbalances is immoral. Even affirmative action and transformation projects have a moral bed from which it should take shape. It is not without boundaries. Transformation must take place within the framework of the Constitution, and the Constitution should not happen within the framework of transformation. White workers’ right to dignity and equality must also be protected, otherwise we would simply entrench that which needs to be redressed in a new system. I wish to refer to the report of the South African Human Rights Commission (SAHRC) on equality published earlier this year. This report was drafted within the context of guidelines for affirmative action programmes as provided by the United Nations’ Committee on the Elimination of Racial Discrimination (CERD). These guidelines include the following: Race may not be the only criterion used with regard to affirmative action; needs must also be taken into account; affirmative action must be context sensitive; it may not be rigid; and it may not lead to racial quotas. Sasol’s lazy solution to simply exclude white workers contravenes each one of those SAHRC guidelines. The issue of racial exclusion from employee share ownership plans was successfully resolved in the Mining Charter negotiations between government, trade unions and business. The outcome of the talks was that workers remain workers, and in that category workers should not be divided according to race. The inequality in South Africa does not lie between workers in blue overalls. To divide them according to race will simply create a new level of inequality in South Africa. Workers at shop floor level where, unlike in politics, healthy relationships are prevailing, will suddenly again be classified according to race. Gross racial classification leads to absurd results. One of our members, who has lost a leg and who, as a disabled person, is part of the designated group, wanted to know from Sasol whether he would be part of Khanyisa. Sasol’s cold and clear answer was that he was not eligible for participation as he is a white person. An Asian member of Solidarity, who is married to a white woman, is furious for while he may participate in Khanyisa, the scheme determines that a white person (such as his wife, for example) may not inherit the shares. A white member of Solidarity, who has been working for Sasol for 30 years, will get no shares, but a black employee who has only been with Sasol for three weeks will receive share worth of R500 000. For the purposes of shareholding the worth of white employees is not determined by their contribution, loyalty or work ethics but simply by race. Those are the absurd realities of a scheme that is based on shaky moral grounds. On Thursday 6 September, on the same day as the strike, it emerged that Sasol has awarded share options worth R106 million to its top executive team. You are both beneficiaries and you will each receive share options of more than R20 million. Mr Cornell, you and the other white executives are included even though you are white. The constitutional duty to transform and the historical justification for racial exclusion do not apply to the top executive level. You will probably argue that you deserve the shares. The moral question, though, is why you do not do unto yourself what you do unto the workers. And so it is that Sasol has a shares scheme for its top executive levels and now also one for black workers with white workers being the only level that is excluded. Being excluded from ownership while others are included signals a message to them that they are not a part of Sasol. This is what gave rise to the anger and the call to be heard and to be recognised. I am putting it to you that Sasol’s decision to exclude white workers was not a moral one but purely a commercial one. It was simply about scoring points on a transformation charter. What the workers’ voice is asking is that a moral basis be included in the commercial decision. Many other companies’ employee share ownership plans do not exclude workers on the basis of race. Right now, Sasol can decide not to listen to this voice and it can carry on with the scheme. However, the workers’ strike showed up the fault line in your argument. The moral fault line is not that you want to empower your black workers but the easy way out in which you want to do it through racial exclusion. The moral solution asks for more nuanced answers such as the SAHRC recommends. 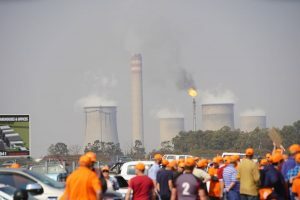 Sasol is a South African and global leader and its moral leadership can offer leadership to South Africa on how to deal with a complex matter such as this one. The basic point of departure for the solution you will find in the Draft Mining Charter which, is the result of many hours of talks and which managed to find wisdom when it comes to the matter of employee share ownership plans. What we are asking of you is not to spoil this opportunity to give new content and shape to democracy by implementing simplistic racial solutions. Let us address an imbalance without creating another imbalance in a new shape. It will require a great deal of extra thinking and talking. If you are going to ignore the voice of the workers then the historical strike by white workers will accuse you in the future.